What better way to spend a lazy day off than floating down a river in a tube? This relaxing activity can be enjoyed alone, or with a group of friends. Float down the river solo with a book in hand, or amongst your friends, listening to a water proof radio. You can even link the tubes to stay together as a group. There are three major sites nearby for river tubing. Ginnie Springs, located on the Santa Fe River in High Springs; Rainbow River, located in Dunnellon; and Ichetucknee Springs located in Fort White. All three of these locations offer tubing, as well as swimming in the springs, snorkeling and picnicking; making it a great place to take the family. 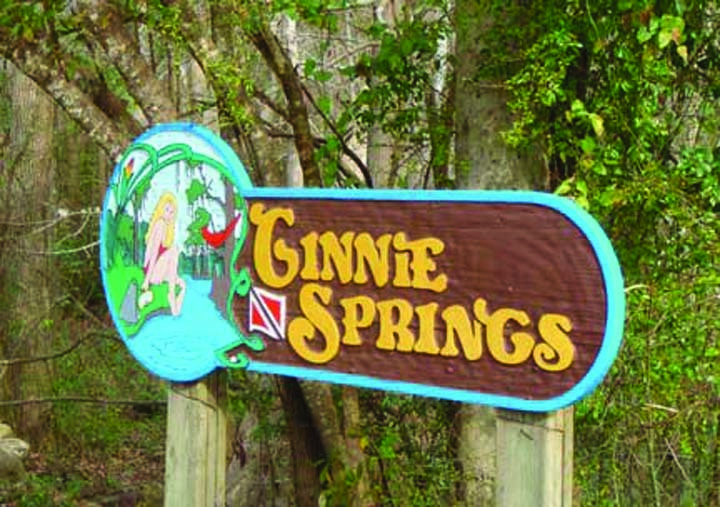 Ginnie Springs’ summer hours are Monday-Thursday from 8 a.m.- 7 p.m., Friday and Saturday from 8 a.m.-10 p.m. and Sunday from 8 a.m.- 8 p.m. General admission for adults (10 percent discount to seniors 62 and up) is $12. Children ages 7-14 cost $3 and children 6 and under are free. When river tubing, most people enter the water at the Devil’s Spring with a tube or raft, and spend about an hour floating down to the tube take-out at Twin Spring. From there, it’s about a 15 minute walk to the Ginnie Springs parking lot. If you bring your own tube, there is a free air filling station. Tubes are also available for rent at the country store. It cost $6 per day for a single tube, and $12 for a double tube. If you tire of tubing, pull off to the side and swim for a bit in the springs. The water is crystal clear and 72 degrees, perfect for seeing fish or turtles. If you forgot your goggles and snorkel they are also available for rent. For more information, visit www.ginniespringsoutdoors.com. The Rainbow River is about 20 miles southwest of Ocala, and 100 north of the Tampa Bay area. This winding river is 5.7 miles long and merges with the Withlacoochee River. The tubing entrance to the park is located at 10830 S.W. 180th Ave Rd in Dunnellon. Parking is very limited, and once the lot is full the park will close until a parking space opens up. The lot is usually full by 10 a.m. Once you reach the entrance, you can rent a tube and ride the tram up the river, and float back. Depending on the wind, you will enjoy your floating for an hour and a half. After you float down the river, show your receipt for free admission to the headsprings area of the park at the US 41 entrance for picnicking, nature sightseeing and swimming. It costs $11, including the tram ride, to rent your tube. It cost $5 per person for the park entry fee, and children under 5 a free. The park is open during the summer from 8 a.m.-8 p.m. every day. For more information, visit www.therainbow river.com/tubing.html. Tubing at Ichetucknee River runs from Memorial Day through Labor Day. It cost $5 per person, and children 5 years and younger are free. Tubes can be rented, or brought from home. However, to float freely down the river, tubes need to be smaller than five feet in diameter. To tube, you will follow the mid-point trail or tram road to the mid-point dock, about a 15 minute walk. You will float lazily down the river for about half an hour to Dampier’s landing, and from there it’s about a five minute walk back to the parking lot. Or, you can continue tubing down the river for an additional hour. From there, it is about a 15 minute walk to the parking lot. For more information, visit www.floridastateparks.org/ichetuckneesprings/default.cfm.